Focus on FinTech [Season 2 Ep. 3]: What makes a successful FinTech? FinTech and Startup. Today these words are almost synonymous, and the journey that startups, these FinTechs, go through from glint of an idea to their success or failure is seen at every turn. From Uber and Lyft, to the dramatic rise of Facebook. But what is the key to being a successful Fintech? And what are the mistakes to avoid? In the mid-season finale of Season 2: What makes a successful FinTech? Join Eric Hazard and a host of seasoned FinTech Entrepreneurs and experts as they give advice and learnings from their own experiences on the do's and don'ts of starting a FinTech, or even a company, and discuss the key to becoming a successful FinTech. "ALERT: There has been suspicious activity on your account. Everyone's received one of these messages in their time. Maybe you used your credit card in another country, you took cash out on a business trip, or something much worse has happened. But what can you do against this activity? Can you protect yourself completely? And what are banks and corporations doing to protect your data? In the finale of Season 2: Counter Measures join Eric Hazard and top security experts as they look into what regular people can do to protect themselves from financial crime, what banks and organizations are doing to protect your data and what you should do if you're the victim of a crime yourself! ALERT: There has been suspicious activity on your account. Everyone's received one of these messages in their time. Maybe you used your credit card in another country, you took cash out on a business trip, or something much worse has happened. But who are these "hackers" stealing our money? Are they stealing anything else? Are they all just guys in hoodies in basements trying to disrupt the world? In Episode 5: Under the Hoodie, join Eric Hazard and top financial security experts as they reveal our deep misconceptions about who these hackers are and what they are doing with our information. Learn who's actually under the hoodie, what's in it for them and the economy of black market data. ALERT: There has been suspicious activity on your account. Everyone's received one of these messages in their time. Maybe you used your credit card in another country, you used a sketchy ATM, or something much worse has happened. But what is this "suspicious activity" they're talking about? How do they know it's not you? And what else do they know? In Episode 4 of Season 2: Suspicious Activity we begin a 3 part journey into digital financial fraud and crime. Join Eric and top industry experts to learn what is really going on inside the banks that lead to this alert, what "suspicious activity" really means and more! FinTech and Startup. Today these words are almost synonymous, and the journey that startups, these FinTechs, go through from glint of an idea to their success or failure is seen at every turn. From Uber and Lyft, to the dramatic rise of Facebook. But who is investing in these companies? Who is spending hundreds, thousands or millions of dollars on an idea? And how do entrepreneurs really get a piece of the action? Join Eric Hazard and a host of season FinTech Entrepreneurs for Episode 2: VCs, Stakeholders and Investors - When Life Gives You Lemons and learn from real experiences what the funding landscape really looks like, how our entrepreneurs achieved investment and how a FinTech can go from a lemon tree to making lemonade. FinTech and Startup, two words that have become almost synonymous. The journey that startups, these FinTechs, go through from a glint of an idea, to their success or failure is seen at every turn, from the dramatic rise of Facebook to the ups and downs of Uber and Lyft. But how do FinTech companies really get started? Is it really such smooth sailing? This 3 part discussion, the first half of Season 2, will discuss just that. In the Focus on FinTech Season 2 Premiere: A FinTech is Born, join Eric Hazard and a host of seasoned FinTech entrepreneurs as they discuss what is "supposed" to happen, and then what really happens when you start a FinTech. Join Eric and guests as they share their experiences, trials, and tribulations and how they did, and what they had to do, to get their companies started and advice for anyone starting on their own journey. The FinTech industry has taken the financial world by storm, but what is FinTech and how does it affect you? BrightTALK has created the Focus on FinTech series to explore the industry as a whole and answer all your FinTech questions. We've rounded up the best and brightest in the industry to explain what FinTech is, talk about the latest trends and share their insights. Focus on FinTech Season 1 takes us through the basics of FinTech, Robo Advising, the future of the FinTech industry, blockchain and more. Focus on FinTech Season 2 is premiering October 2018 - Join Eric Hazard each week as he and his guests tackle questions facing this industry, including the lifecycle of a FinTech and payment security. 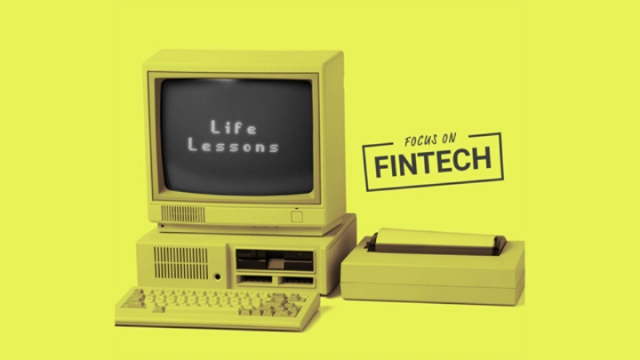 Make sure to watch the first season on-demand and register for the second season here https://www.brighttalk.com/topic/fintech/! Make sure to watch the first season on-demand and register for the second season here https://www.brighttalk.com/topic/fintech/. Focus on FinTech Season 1 takes us through the basics of FinTech, Robo Advising, the future of the FinTech industry and blockchain. Season 2 is premiering October 2018 - Join Eric Hazard each week as he and his guests tackle questions facing this industry, including the lifecycle of a FinTech and payment security. Digital Currency is becoming a day-to-day part of peoples lives, from Bitcoin to Ethereum and beyond. With them have come powerful new advances in record management, transactions and open ledgers with the Blockchain and other distributed ledgers. But even is all this stuff? In this Episode Eric talks to two experts about the fantasy world that is Digital Currency and Distributed ledgers. You order an Uber through your phone. You get in, complete your ride, get out and say goodbye. You don't even take out a credit card or cash anymore but you know it's been paid for. So how does it work? Is it safe? And what's the future of our financial interactions? Uber and many other Fintechs have taken the interaction out of transactions but it's often unclear how they actually work, and many of them still reply on a traditional bank. So we've sent Eric Hazard to discover the ins, outs and dirty secrets of your favorite taxi apps, food delivery hubs and fintechs! The FinTech industry has taken the financial world by storm, but does it have the legs to change it and keep those changes? Eric wants to know if this industry is here to stay, and talks to the people who are talking about FinTech to find out. Eric is a new father, suddenly he's got college and mini-vans to think about, but what about that holiday to the bahamas? Or that boat he's always wanted? Robo-Advisory is the hot new trend in saving and investment, but can it really be better than the alternative? Should you really trust a robot with your money? In this episode Eric talks with Mansi Singhal, Co-Founder at qplum, a New York based Robo-advisor and they talk about investing, robots, engineers, New Jersey, and more! In this premiere episode of Focus on FinTech, Eric invites Greg Mitdbo of Moven out on the Staten Island Ferry to get to grips with what Fintech really is. - What is Fintech for the consumer? - How does it differ from incumbent finance? Is it better? - How does Fintech build trust for its users? Join Eric Hazard on Focus on Fintech each month as he, and his guests, tackle an issue or question facing the world of Fintech. Focus on Fintech is a new interview series for the world of Fintech. Each month our resident FinTechXpert, Eric Hazard, steps out of his office and chats with a leading FinTech figure about something he's been thinking about. From the future of retirement planning, to ApplePay and Crowdfunding, Eric wants to get to the bottom of the world of FinTech. Title: Focus on FinTech [Season 2 Ep. 3]: What makes a successful FinTech?